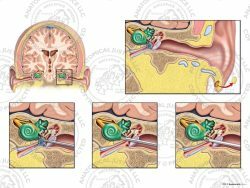 This exhibit depicts the anatomy of the tympanic cavity and inner ear. 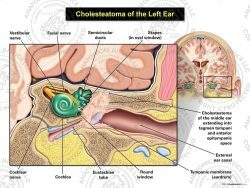 Anatomical structures include: the tympanic membrane, ossicles, semicircular canals, and cochlea. The semicircular canals function as an anatomical "level," allowing for a sense of equilibrium. The superior and posterior canals sense vertical movements, while the horizontal canal senses horizontal movements. 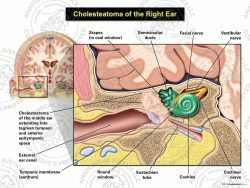 The tympanic membrane, ossicles, and cochlea are responsible for the sense of sound. Sound waves enter the ear canal and vibrate the tympanic membrane. These vibrations cause the malleus to strike the incus, which transfers the vibrations to the stapes bone. 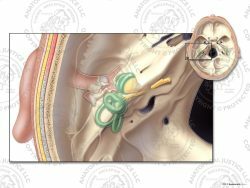 The footplate of the stapes rests within a structure called the oval window in the side of the cochlea. 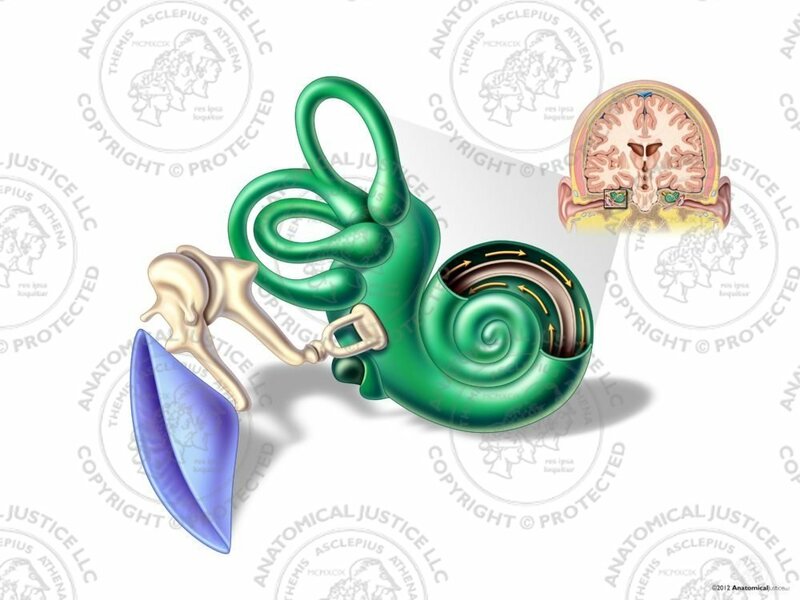 When the stapes moves, the endolymph (fluid) within the cochlea is sent in motion. The fluid flows through the scala vestibuli in the cochlear spiral, and vibrates the vestibular membrane over the cochlear duct. Specialized hair cells within the cochlear duct are set in motion, generating electric impulses. These impulses are then transmitted to the cochlear nerve, which transfers the information to the brain for interpretation.